Fully connected by road, rail, and air to the Western United States and California’s vast marketplace. Twenty four hour delivery to 50 million people and just four hours from the Port of Oakland. Redding Municipal Airport handles regional cargo. FedEx, UPS and USPS serve the airport using heavy and light trucks, airfreight and charter air service. Redding Municipal Airport is a full service airport which provides commercial airline passenger service, aviation related services and aircraft hangar facilities. Daily commercial airline passenger service is provided by Skywest Airlines, dba, United Express to San Francisco. Situated in Northern California, Redding is only a few hours away from the Port of Oakland – the third-largest container port in the US, and the 5th busiest. This port is the only place in the US where all 20 top ocean carriers regularly have service. And approximately 41 billion dollars of transit goods are brought through the Port of Oakland every year. With 7 efficient state-of-the-art terminals and 18 deepwater berths, there simply isn’t another place quite like the Port of Oakland for sea transportation on the western seaboard. We in Shasta County are lucky to be situated so close to such a major hub of transport and economic activity. This makes us an important link in supply chains involving cargo transport/ocean travel. 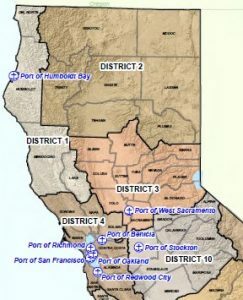 Read the Port of Oakland directory for more information on sea transport in northern California. Shasta Region’s strategic location on Interstate 5 – midway between San Diego and Seattle – makes it a highly efficient distribution point for products headed to all major markets on the West Coast. State Highway 44 connects eastbound with Interstate 80 to Salt Lake City, Utah. State Highway 299 out of Redding provides access to the California coast. Daily service by several major carriers with several local, state, and interstate carriers servicing California, Oregon, Washington, Nevada, and Arizona. One-day service to Portland, Seattle, and Los Angeles. Two Class I railroads, Union Pacific and Burlington Northern Santa Fe. Main route runs north-south parallel I-5 corridor and connects service with main east-west corridors at Seattle, Portland, Oakland and Los Angeles. Passenger service in Redding is available on Amtrak north and south.